On February 13, 2012, 2,768 names were read out by Chief Judge Giuseppe Casalbore during the handing down of the verdict in, what has become known as, the Great Asbestos Trial.1 All the people named had been awarded compensation for the asbestos injuries they or their loved ones had sustained at the hands of defendants Stephan Schmidheiny and Jean-Louis de Cartier de Marchienne, executives of corporations belonging to the Eternit Group of companies. The three members of the judicial tribunal stood throughout the three hours it took to read their findings as did most of those present, including lawyers, victims, and the representatives of municipal authorities and the media in courtroom 1. 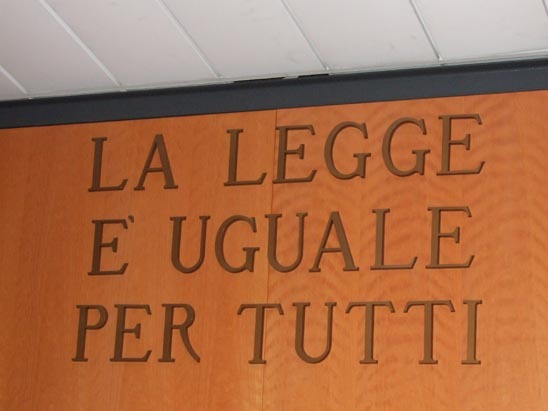 It was a solemn and dignified occasion, a manifestation of the promise inscribed on the wall above the podium: La Legge E Uguale Per Tutti (The Law is Equal for All). Courtroom 1 was full to capacity with crowds of TV reporters and film crews crammed together towards the back. 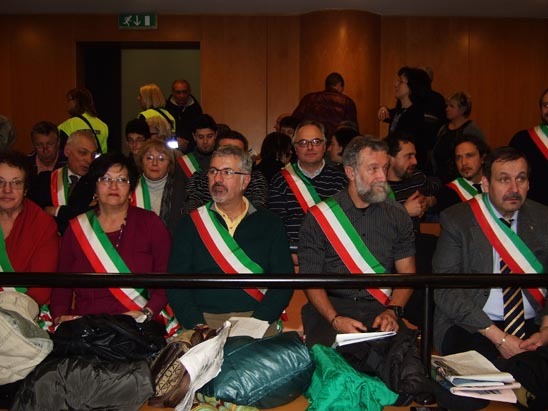 On the right-hand side were rows occupied by asbestos victims and relatives of victims; next to them were representatives from more than a dozen Italian municipalities contaminated by the operations of Eternit asbestos-cement factories. Municipal representatives from Italian towns. The majority of victims and family members were accommodated in another packed auditorium; 23 coachloads of people from Casale Monferrato had made the journey to Turin to witness the proceedings. It is believed that there were more than 1,500 people present in four courtrooms. Delegations from France, Belgium, Switzerland, the UK and the US were in courtroom 2 where simultaneous translations in French and English were available. This was the first time translations had been provided by the Turin criminal court; the fact that the translations were streamed live over the internet (see: http://asbestosinthedock.ning.com/) was a reflection of the enormous worldwide interest in this case. Members of the French victims' delegation. Associazione Medicina Democratica (Democratic Medical Association) €70,000. Collectively it is believed that the financial penalties imposed by the criminal court amounted to around €90 million. The consensus of opinion amongst those present at the court was that neither the defendants nor the companies named alongside them as jointly and severally liable for these crimes would be posting off checks any time soon. Discussions continue regarding the options available to recover the damages. This lawsuit was pioneered by Turin Public Prosecutor Raffaele Guariniello, who spent 10 years researching the background to the case, the crimes and the criminals involved. Unlike asbestos litigation in countries like the UK and the U.S., the asbestos victims did not have to pay any legal fees or court costs; these were borne by the office of the public prosecutor. As the February 13th proceedings were brought to a close, Guariniello was mobbed by well-wishers and members of the press. 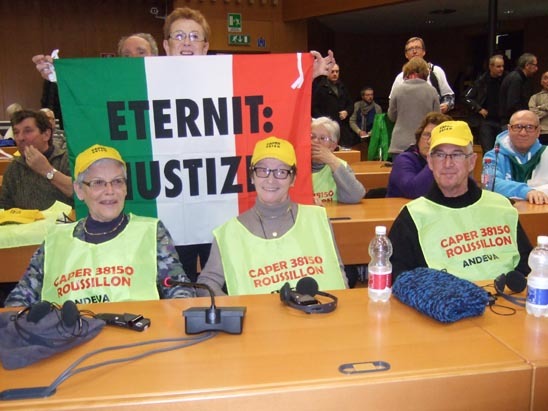 Clearly satisfied with the ruling, he said: Today we have the right to dream that justice can be done and must be done. Guariniello has already started work on Eternit 2, a case involving hundreds of Italians who have died since 2009 from asbestos-related diseases. The day after the landmark verdict was announced, I flew over Switzerland on the way back to London. 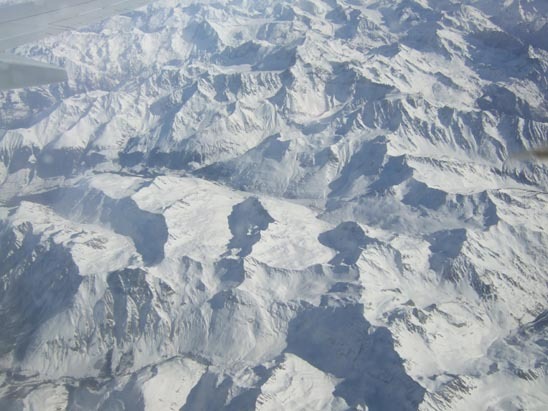 As I gazed at the snow topped mountains from the window of the plane, I wondered whether the Swiss Alps were high enough to protect Stephan Schmidheiny's billions from the reach of the Italian authorities. Given the tenacity and skills evinced by Prosecutor Guariniello and his team, I wouldn't be too sure. 2 Press Release. Declaration of Associazione Famigliari Vittime Amianto (Association of Asbestos Victims' Families). February 14, 2012.